This is the first volume in the three part set is chocked full of even more details and drawings to help with your MB/GPW needs. 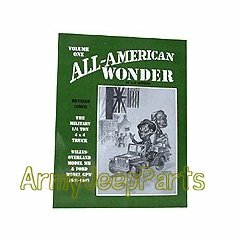 All American Wonder Vol I. This book by Ray Cowdry original came out in 1986 and has been revised on time in 1993. Over 150 rare photos and line drawlings. This is a must have for any military jeep buff. 144 pages.